Last weekend I went to the Savvy-Delights retreat. Proudly bought to you by Scrapbooking Delights a bricks and mortar store in Dapto and Scrapbook Savvy an online store. I must say this now: BEST RETREAT EVER! Not only because of the awesome company of some amazing scrappers, but because the retreat was run so well. There were challenges galore which kept me focused and and motivated. Here's the point where I would be showing my layouts. But I haven't yet photographed them. Tomorrow. I promise. I do however have a photo taken by the amazingly talented Lisa Oxley though. I have always been a fan of Lisa's scrapping. I think it has something to do with the fact that I could never free myself enough to immerse myself in the art of scrapbooking. I just cut and stick. Lisa truly creates. In other news, I had my first official point scoring night at athletics last night. I am a little sore and limping around a bit today. Although it didn't stop me from strolling around the library with Sarah and grabbing a peach ice tea. And here's my photo from September 19. Underneath. 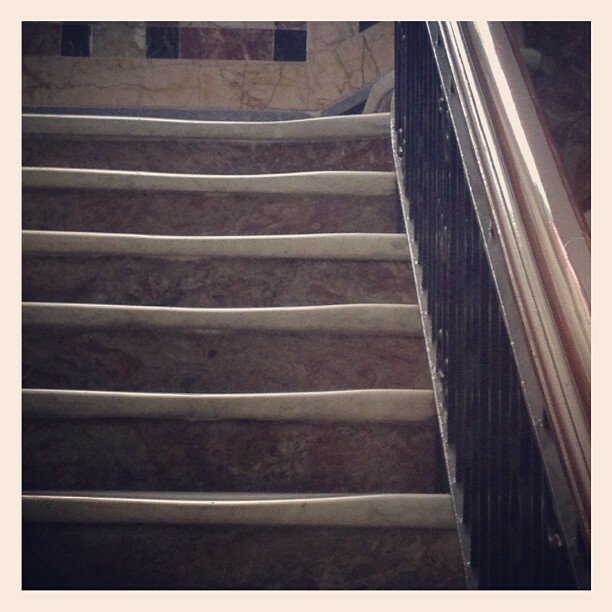 I honestly love the wear on the marble staircase at my work. I walk up this flight of stairs and I often wonder about the people who have also walked this walk. And then when I get to the top as it is a double height foyer, I feel sorry for the poor suckers that have made the impressions on the next flight up. Great stuff with your athletics I look forward to hearing more about it. LOL! You certainly will Rach, because I will run out of things to write about!